If you've stopped by my blog in the last few months, you know I've been posting various Test Tube Holder Boxes that I created patterns for, well today I had an idea and thought I'd give it a whirl. I just received the Bigz Box #2 Die Cut from the Spring Summer Catalog, and as I was putting my box together, I wondered what I could put inside, since the box was rather small. Then it hit me like a ton of bricks! The Pug-tastic Small Round Tubes would fit perfectly in these boxes - with the die cut box, these Test Tube Holders are easy peasy! To create the openings on the top flap of my box, I simply cut a post-it note the size of my flap, folded it to get my center lines, then inserted my 3/4" circle punch in the center, punched that hole, then moved to the sides and punched each side hole. Tucked my flap back into the box, filled my Tubes with Sour Jolly Ranchers (that's all I had in the house). Then finished decorating the panel using the hearts from Love You Much and Triple Dimension Technique. 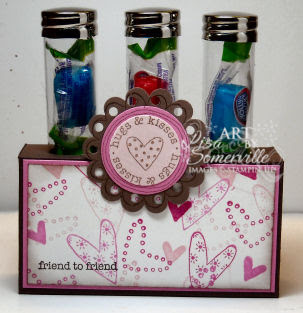 Need to order the supplies to create these boxes - stop by my website, then click on the shop now button - you can order 24/7! Don't forget for each $50 in product you order you'll earn one FREE Sale-A-Bration set! Fantastic Lisa. I have LOTS of these tubes and need to get busy with your design to use some of them. Thanks for the inspiration! Pugtastically terrific! Now I gotta go look at the catty! You are so Creative. I love your ideas. I ordered a bunch of these tubes. I cant wait to make them. Keep coming up with your ideas. Because my head goes CRAZY everytime I see a new one I love. Genius! And that die is in my box as well! :D You are having just a true genius of a week....keep up the awesome groove girl!! !